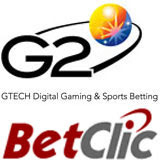 One of Europe’s fastest growing igaming operators, BetClic.com, is renewing its poker license and integrating GTECH G2’s download and flash casino, Games Room and new player-centric Gaming Management System (GMS). As a customer of GTECH G2’s International Poker Network (IPN) since 2006, this product extension offers BetClic the opportunity to augment its casino and games portfolio with access to over 300 flash and download casino games from G2. BetClic’s poker players will also be able to access casino games directly from the poker table too. “We are happy to develop our partnership with GTECH G2.Thanks to this successful collaboration, we keep on perfecting our services to provide the best offer to all of our customers,” said Nicolas Béraud, founder and CEO of BetClic. The Games section available on BetClic.com already features a wide selection of instant-win side games developed by Dynamite Idea, one of the games software development units within GTECH G2. The Games menu currently features Triple Chance HiLo, Top Trumps Football Stars, Virtual Football, Bar X 125, Roulette, Blackjack, Casino Dice, Poker Dice, Keno and Bingo Keno Extreme but when the new GMS is in place, new games will be easily added. BetClic, sponsors of the Olympic Lyon in France and Juventus Club in Italy, is part of the Mangas Gaming Group which also operates Expekt.com and Bet-at-home.com. This agreement includes the option to feature GTECH G2 casino, poker and games on these sites as well.